(NaturalNews) At the Fukushima-Daiichi nuclear power plant, radiation isn't the only thing leaking out. Each week, it seems there's another small leak of the truth that has been deliberately hidden from the public. Yesterday, TEPCO finally admitted it has been downplaying the ongoing radiation release levels by a factor of almost twenty. But the real story here is exactly how TEPCO arrived at the deceptively small numbers it has been reporting since the 2011 accident. It turns out (see below) that TEPCO has been deliberately using radiation detectors that "max out" at relatively low levels (i.e. they don't go higher than 100 mSv). When those detectors are pegged at their max readings, instead of switching to a more capable instrument with a larger detection range, they simply report the maximum detection limit of the smaller detector as the "real" exposure number. According to a TEPCO press release covered in Bloomberg Japan, "TEPCO announced high-dose radiation of hourly 1800 mSv from the tank periphery has been observed." This is highly radioactive water leaking from the now-famous "storage tanks" that were never designed to be long-term storage tanks in the first place. 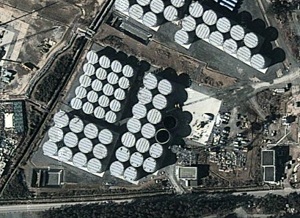 Previously, TEPCO told the public these tanks were only leaking 100 mSv per hour, downplaying the actual radiation leak level by almost 95%. Ito Tetsuo Professor of Kinki University (radiation biology) said, regarding the level of hourly 1800 mSv, "There is only a thing called death if you stay exposed to this for four hours. One hundred percent of persons will die within 30 days." Radiation levels around Japan's Fukushima nuclear plant are 18 times higher than previously thought, Japanese authorities have warned. It now says readings taken near the leaking tank on Saturday showed radiation was high enough to prove lethal within four hours of exposure. And that's the understatement of the year. "Direct implications" means the clean-up workers are already dead. So how, exactly, did TEPCO get readings of just 100 mSv per hour until recently when they discovered readings of 1800 mSv per hour? You won't believe this when I tell you: They were using a radiation meter that maxed out at 100 mSv. Using the same logic, I'm going to patent the "Fukushima weight loss miracle" program that includes a body weight scale which only goes up to 110 lbs. No matter how heavy you are when you step on it, it will only read 110. It's a TEPCO weight loss miracle! TEPCO, in other words, has been running around measuring radiation using radiation detectors that are, by design, incapable of measuring the full extent of the radiation being released. It then reports the "actual" radiation level as whatever the MAX detection limit is on the low-end detectors. This is so intellectually dishonest that it borders on criminal. Not only did TEPCO use "scientific sleight of hand" to deliberately use low-range radiation detectors and thereby mislead the world, the company also used its deceptively low 100 mSv exposure lie to calculate how many hours clean-up workers could safely spend in the facility without being irradiated to death. It turns out those calculations were off by a factor of 18. And that means all the clean-up workers have received 1800% more radiation than they were told. TEPCO, in other words, has condemned these people to die a painful, suffering death by intentionally withholding from them the actual radiation readings. It is inconceivable, of course, that the country's largest nuclear power facility company would not possess radiation detectors capable of detecting 1800 mSv per hour. This deceptive strategy to downplay the actual radiation release was clearly deliberate. It's all part of the TEPCO cover-up / conspiracy to lie to Japan, lie to their workers and lie to the world about the true scale of the nuclear disaster that has taken place there. That has been the TEPCO approach from day one: LIE! Remember, TEPCO was also behind the Japanese government's bizarro brainwashing propaganda campaign that told people they would be immune to radiation if they just drank beer or smiled a lot. We also know from news reports in 2011 that TEPCO ran around the Fukushima facility turning off the radiation detectors to prevent alarms from going off. Radiation? What radiation? And now we find out the company has been deliberately using radiation detectors that max out at just 100 mSv. But even that explanation doesn't hold water, as every person who uses scientific instruments knows that if your measurement maxes out the instrument, get a bigger instrument! In other words, if your car's speedometer maxes out at 120 mph, but you floor it on the autobahn and keep accelerating far past 120 mph, it doesn't mean you're still only going 120 mph just because that's what the speedometer says. Hopefully this point is obvious. Yet TEPCO was running around with all these pegged radiation detectors, claiming the "max" was the accurate real-time number. If TEPCO lied about radiation leaks, what else is it lying about? This brings up the most important point of this article: What else is TEPCO lying about? Just about everything, it seems. TEPCO still won't admit the plant suffered a fuel core meltdown. They still won't admit the facility is on the verge of collapsing, which would release a huge deadly cloud of radiation that would devastate North America. And of course they won't admit that they need international help to solve the problem. As a result, thanks to the arrogance and criminal dishonesty of top-level TEPCO managers and bureaucrats, yet another massive radiation release from Fukushima is inevitable. In fact, it's just one earthquake away.